Alexander Vasilyevich Suvorov (Russian: Алекса́ндр Васи́льевич Суво́ров, r Aleksandr Vasil‘evich Suvorov; 24 November [O.S. 13 November] 1729 or 1730 – 18 May [O.S. 6 May] 1800) was a Russian military leader, considered a national hero. He was the Count of Rymnik, Count of the Holy Roman Empire, Prince of Italy, and the last Generalissimo of the Russian Empire. Suvorov was born in Moscow in 1729. He studied military history as a young boy and joined the Imperial Russian Army at the age of 17. During the Seven Years' War he was promoted to colonel in 1762 for his success on the battlefield. When war broke out with the Bar Confederation in 1768, Suvorov captured Kraków and defeated the Poles at Lanckorona and Stołowicze, bringing about the start of the Partitions of Poland. He was promoted to general and next fought in the Russo-Turkish War of 1768–1774, winning a decisive victory at the Battle of Kozludzha. Becoming the General of the Infantry in 1786, he commanded in the Russo–Turkish War of 1787–1792 and won crushing victories at the Battle of Rymnik and Siege of Izmail. For his accomplishments, he was made a Count of both the Russian Empire and Holy Roman Empire. Suvorov put down a Polish uprising in 1794, defeating them at the Battle of Maciejowice and storming Warsaw. While a close associate of Empress Catherine the Great, Suvorov often quarreled with her son and heir apparent Paul. After Catherine died of a stroke in 1796, Paul I was crowned Emperor and dismissed Suvorov for disregarding his orders. However, he was forced to reinstate Suvorov and make him a field marshal at the insistence of the coalition allies for the French Revolutionary Wars. Suvorov was given command of the Austro-Russian army, captured Milan, and drove the French out of Italy at the Battles of Cassano d'Adda, Trebbia, and Novi. Suvorov was made a Prince of Italy for his deeds. Afterwards he became surrounded in the Swiss Alps by the French after a Russian army he was supposed to unite with was routed before he could arrive. Suvorov led the strategic withdrawal of Russian troops while fighting off the four times as large French forces and returned to Russia with minimal casualties, for which he became the fourth Generalissimo of Russia. He died in 1800 of illness in Saint Petersburg. Alexander Suvorov was born into a noble family originating from Novgorod at the Moscow mansion of his maternal grandfather Fedosey Manukov. His father, Vasiliy Suvorov, was a general-in-chief and a senator in the Governing Senate, and was credited with translating Vauban's works into Russian. His mother, Avdotya Fyodorovna née Manukova, was the daughter of Fedosey Manukov. According to a family legend his paternal ancestor named Suvor had emigrated from Sweden with his family in 1622 and enlisted at the Russian service to serve Tsar Mikhail Feodorovich (his descendants became Suvorovs). Suvorov himself narrated for the record the historical account of his family to his aide, colonel Anthing, telling particularly that his Swedish-born ancestor was of noble descent, having engaged under Russian banner in the wars against the Tartars and Poles. These exploits were rewarded by Tsars with lands and peasants. This version, however, was questioned recently by prominent Russian linguists, professors Nikolay Baskakov and Alexandra Superanskaya [ru], who pointed out that the word Suvorov more likely comes from the ancient Russian male name Suvor based on the adjective suvory, an equivalent of surovy, which means "severe" in Russian. Baskakov also pointed to the fact that the Suvorovs' family coat of arms lacks any Swedish symbols, implying its Russian origins. Among the first of those who pointed to the Russian origin of the name were Empress Catherine II, who noted in a letter to Johann von Zimmerman in 1790: "It is beyond doubt that the name of the Suvorovs has long been noble, is Russian from time immemorial and resides in Russia", and Count Semyon Vorontsov in 1811, a person familiar with the Suvorovs. Their views were supported by later historians: it was estimated that by 1699 there were at least 19 Russian landlord families of the same name in Russia, not counting their namesakes of lower status, and they all could not descend from a single foreigner who arrived only in 1622. Moreover, genealogy studies indicated a Russian landowner named Suvor mentioned under the year 1498, whereas documents of the 16th century mention Vasily and Savely Suvorovs, with the last of them being a proven ancestor of General Alexander Suvorov. The Swedish version of Suvorov's genealogy had been debunked in the Genealogical book of Russian nobility by V. Rummel and V. Golubtsov (1887) tracing Suvorov's ancestors from the 17th-century Tver gentry. In 1756 Alexander Suvorov's first cousin, Sergey Ivanovich Suvorov, in his statement of background (skazka) for his son said that he did not have any prove of nobility; he started his genealogy from his great-grandfather, Grigory Ivanovich Suvorov, who 'served as a dvorovoy boyar scion at Kashin. As a boy, Suvorov was a sickly child and his father assumed he would work in civil service as an adult. However, he proved to be an excellent learner, avidly studying mathematics, literature, philosophy, and geography, learning to read French, German, Polish, and Italian, and with his father's vast library devoted himself to intense study of military history, strategy, tactics, and several military authors including Plutarch, Quintus Curtius, Cornelius Nepos, Julius Caesar, and Charles XII. This also helped him develop a good understanding of engineering, siege warfare, artillery, and fortification. He tried to overcome his physical ailments through rigorous exercise and exposure to hardship. His father, however, insisted that he was not fit for the military. When Alexander was 12, General Gannibal, who lived in the neighborhood, overheard his father complaining about Alexander and asked to speak to the child. Gannibal was so impressed with the boy that he persuaded the father to allow him to pursue the career of his choice. Suvorov entered the army in 1748 and served in the Semyonovsky Life Guard Regiment for six years. During this period he continued his studies attending classes at Cadet Corps of Land Forces. He gained his first battle experience fighting against the Prussians during the Seven Years' War (1756–1763). After repeatedly distinguishing himself in battle Suvorov became a colonel in 1762, aged around 33. Suvorov next served in Poland during the Confederation of Bar, dispersed the Polish forces under Pułaski, and captured Kraków (1768), paving the way for the first partition of Poland between Austria, Prussia and Russia, and reached the rank of major-general. The Russo-Turkish War of 1768–1774 saw his first successful campaigns against the Turks in 1773–1774, and particularly in the Battle of Kozluca, he laid the foundations of his reputation, becoming a lieutenant-general in 1774. His later earned victories against the Ottomans bolstered the morale of his soldiers who were usually outnumbered. His astuteness in war was uncanny and he also proved a self-willed subordinate who acted upon his own initiative. For "unauthorized actions against the Turks," Suvorov was tried and sentenced to death but Tsarina Catherine the Great refused to uphold the verdict, proclaiming "winners can't be judged." In 1774, Suvorov was dispatched to suppress the rebellion of Pugachev, who claimed to be the assassinated Tsar Peter III, but arrived at the scene only in time to conduct the first interrogation of the rebel leader, who had been betrayed by his fellow Cossacks and was eventually beheaded in Moscow. The next year, he married into the influential Golitsyn family. A wounded Suvorov saved by Grenadier Novikov at the Battle of Kinburn. From 1774 to 1786, Suvorov served in the Kuban, the Crimea, the Caucasus, Finland, and Russia itself. He became General of the Infantry in 1786, upon completion of his tour of duty in the Caucasus. In 1778, he prevented a Turkish landing in the Crimea, thwarting another Russo-Turkish war. He commanded the Russian troops in the Crimea from 1782 to 1784. In 1783 he suppressed the Kuban Nogai Uprising. On behalf of Empress Catherine II, he organized the resettlement of Armenian migrants displaced from Crimea and gave them permission to establish a new city, named Nor Nakhichevan by the Armenians. From 1787 to 1791 he again fought the Turks during the Russo-Turkish War of 1787–1792 and won many victories; he was wounded twice at Kinburn (1787), took part in the siege of Ochakov, and in 1789 won two great victories at Focşani and by the river Rymnik, where a Russo-Austrian force of 25,000 routed 100,000 Turks within a few hours, losing only 500 men in the process. 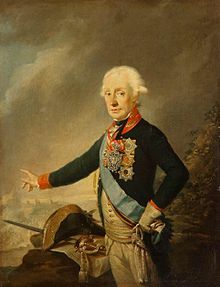 In both these battles an Austrian corps under Prince Josias of Saxe-Coburg participated, but at the battle of Rymnik, Suvorov was in command of the whole allied forces. For the latter victory, Catherine the Great made Suvorov a count with the name "Rymniksky" in addition to his own name, and the Emperor Joseph II made him a count of the Holy Roman Empire. Suvorov led the Siege of Izmail in Bessarabia on 22 December 1790. His capture of the reputedly unconquerable fortress played a vital role in Russia's victory in the war. Turkish forces inside the fortress had the orders to stand their ground to the end and haughtily declined the Russian ultimatum. Their defeat was seen as a major catastrophe in the Ottoman empire. An unofficial Russian national anthem in the late 18th and early 19th centuries "Grom pobedy, razdavaysya!" (Let the thunder of victory sound!) commemorates Suvorov's victory and 24 December is today commemorated as a Day of Military Honour in Russia. Suvorov announced the capture of Ismail in 1791 to the Empress Catherine in a doggerel couplet. The decisive Battle of Praga broke the spirits of the defenders and soon put an end to the Kościuszko Uprising. Though Suvorov ordered his men to spare non-combatants and the evacuation of townspeople, as he did before, after the battle spread to the streets and the insurgents hid in civilian houses, vowing to fight to the last man, many civilians died along with the rebels or were massacred in revenge for the slaughter of the Russian Garrison in Warsaw, when two thousand Russian military servicemen stationed in Warsaw were massacred by Polish soldiers and armed mobs, who played a major role in the attack, and cut with spikes and axes. In Praga, 9,000 rebels and 7,000 civilians or up to 20,000 rebels and civilians died. Despite the rage of his troops, however, thousands of Poles were taken alive and most of those captured in Praga were soon released by Suvorov: 10,000 out of 12,860. Similar figures appear in the writings of Major General Lev Engelgardt, who served under Suvorov: 14,680 captured, of whom 8,000 were released the next day. The practice of releasing thousands of Polish prisoners of war by Suvorov shortly after the battle is confirmed by a letter of State Secretary Dmitry Troschinsky to Count Alexander Vorontsov on 24 November 1794, "Count Suvorov has rendered great services by taking Warsaw, but is unbearably annoying with his inconsistent orders there. All Poles in general, not excluding the main rioters, are being released by him to their homes". The fact that thousands of Poles were taken alive and released soon afterwards on the orders of Suvorov is also evident in other documents, such as the report sent by Suvorov to Count Pyotr Rumyantsev on 7 November, regarding the fate of some of the captives, "Polish Praga prisoners with 3 generals, staff and ober-officers, up to 500, and lower ranks, up to 4,000, as well as the artillery that got in our hands, 101 guns, today will be sent to Varkovic at Kiev. Out of the captured insurgents and defending townspeople, more than 6,000 have been released". 500 captured Polish staff and ober-officers were released by Suvorov en route to Kiev, as is confirmed by the autobiography of Major General Sergey I. Mosolov, who escorted them in 1794. After the victory, Suvorov sent a report to his sovereign consisting of only three words: "Hurrah, Warsaw's ours!" (Ура, Варшава наша!). Catherine replied in two words: "Hurrah, Field-Marshal!" (rus. Ура, фельдмаршал! — that is, awarding him this title). Suvorov remained in Poland until 1795, when he returned to Saint Petersburg. But his sovereign and friend Catherine II died in 1796, and her son and successor Paul I dismissed Suvorov in disgrace. As in Praga, Suvorov soon released most of his Polish captives, numbering 25,469, which caused a critical remark from the Russian State Secretary, and in his report to Catherine II recommended not to levy a contribution on the Polish capital. To prevent any further excesses, Suvorov ordered his troops stationed in Poland to keep "serenity, quietness and friendliness" and prohibited them, under the threat of punishment, from oppressing the local population or even showing any forms of disrespect towards the Polish people of all ranks. In February 1799, Paul I, worried about the victories of France in Europe during the French Revolutionary Wars and at the insistence of the coalition leaders, was forced to reinstate Suvorov as field marshal. Suvorov was given command of the Austro-Russian army and sent to drive France's forces out of Italy. Suvorov and Napoleon never met in battle because Napoleon was campaigning in Egypt at the time. However, Suvorov erased practically all of the gains Napoleon had made for France during 1796 and 1797, defeating some of the republic's top generals: Moreau at Cassano d'Adda, MacDonald at Trebbia, and Joubert at Novi. He went on to capture Milan and became a hero to those opposed to the French Revolution. French troops were driven from Italy, save for a handful in the Maritime Alps and around Genoa. Suvorov himself gained the rank of "Prince of the House of Savoy" from the King of Sardinia. He was officially promised a military triumph in Russia but Emperor Paul cancelled the ceremony and recalled the Russian armies from Europe. Early in 1800 Suvorov returned to Saint Petersburg. Paul refused to give him an audience, and, worn out and ill, the old veteran died a few days afterwards on 18 May 1800, at Saint Petersburg. Suvorov was meant to receive the funeral honors of a Generalissimo, but was buried as an ordinary field marshal due to Paul's direct interference. Lord Whitworth, the British ambassador, and the poet Gavrila Derzhavin were the only persons of distinction present at the funeral. Suvorov lies buried in the Church of the Annunciation in the Alexander Nevsky Monastery, the simple inscription on his grave stating, according to his own direction, "Here lies Suvorov." Suvorov was married to Varvara Ivanovna Prozorovskaya of the Golitsyn family and had a son and daughter, but his family life was not happy and he had an unpleasant relationship with his wife due to her infidelity. Suvorov's son, Arkadi Suvorov (1783–1811) served as a general officer in the Russian army during the Napoleonic and Turkish wars of the early 19th century, and drowned in the same river Rymnik in 1811 that had brought his father so much fame. The drowning of his son in the river is supported by Aleksey Yermolov's memoirs, as well as by the military historian Christopher Duffy. His grandson Alexander Arkadievich (1804–1882) served as Governor General of Riga in 1848–61 and Saint Petersburg in 1861–66. Suvorov's daughter Natalia Alexandrovna (1775–1844) known under her name Suvorochka married Count Nikolay Zubov. Suvorov won 63 major battles and never lost one. He was seriously wounded six times in his military career. Suvorov was always located in the most exposed position on the battlefield, for he wanted to share the same risks and discomforts as his soldiers. He never wore warm clothing during cold winters and always slept on a simple bed of straw. Forming a paternal relationship with his soldiers, he appreciated their courage and endurance and in return Suvorov enjoyed the loyalty, respect and affection of his troops. Suvorov’s guiding principle was to detect the weakest point of an enemy and focus a devastating attack upon that area. He would send forth his units in small groups as they arrived on the battlefield in order to sustain momentum. Suvorov utilized aimed fire instead of repeated barrages from line infantry and applied light infantrymen as skirmishers and sharpshooters. He used a variety of army sizes and types of formations against different foes: squares against the Turks, lines against Poles, and columns against the French. His gibes procured him many enemies. He had all the contempt of a man of ability and action for ignorant favorites and ornamental carpet-knights. But his drolleries served sometimes to hide, more often to express, a soldierly genius, the effect of which the Russian army did not soon outgrow. If the tactics of the Russians in the Russo-Japanese War of 1904–1905 reflected too literally some of the maxims of Suvorov's Turkish wars, the spirit of self-sacrifice, resolution and indifference to losses there shown formed a precious legacy from those wars. Mikhail Ivanovich Dragomirov (1830–1905) declared that he based his teaching on Suvorov's practice, which he held as representative of the fundamental truths of war and of the military qualities of the Russian nation. Suvorov considered Hannibal, Alexander the Great, Julius Caesar, and Napoleon Bonaparte to be the greatest military commanders of all time. His high regard for Napoleon is interesting because he did not live to see the Napoleonic Wars. Suvorov is often compared to Napoleon, whom he was on opposing sides of during the late French Revolutionary Wars and desired to face in battle, but never did so because Napoleon was campaigning in Egypt while Suvorov was campaigning in Italy. Military historians often debate between Suvorov and Napoleon as to who was the superior commander. His political views were centered around enlightened monarchy. However, Suvorov had no interest in pursuing politics and made his disdain for the court lifestyle and tendencies of aristocrats well known. Suvorov was buried in Saint Petersburg in the Alexander Nevsky Lavra. His grave stone states simply: "Here lies Suvorov". Within a year after his death, Paul I was murdered in his bedroom for his disastrous leadership by a band of dismissed officers and his son and successor Alexander I erected a statue to Suvorov's memory in the Field of Mars. Monument to Suvorov as youthful Mars, the Roman god of war, by Mikhail Kozlovsky in St. Petersburg (1801). A ‘Suvorov school’ of generals who had apprenticed under him played a prominent role in the Russian military. Among them was future Field Marshal Mikhail Kutuzov who led the Imperial Russian Army against Napoleon during the Napoleonic Wars, including the French invasion of Russia. During World War II, the Soviet Union revived the memory of many pre-1917 heroes in order to raise patriotism. Suvorov was the Tsarist military figure most often referred to by Joseph Stalin, who also adopted the rank of Generalissimo that Suvorov had previously held. The Order of Suvorov was established by the Presidium of the Supreme Soviet on 29 July 1942 and is awarded to senior army personnel for exceptional leadership in combat operations against superior enemy forces. In Russia, there are 12 secondary-level military schools called Suvorov Military School that were established during the USSR. There is also a military school in Minsk named after Suvorov. A military school named after Alexander Suvorov and Valerian Madatov is currently being constructed in the Armenian-populated Nagorno-Karabakh Republic under a national security program. The school is going to be the most up-to-date in the Commonwealth of Independent States (CIS) in its architecture, technical equipment and education methods. Poet Alexander Shishkov devoted an epitaph to Suvorov, while Gavrila Derzhavin mentioned him in "Snigir" (Bullfinch) and other poems, calling Suvorov "an Alexander by military prowess, a stoic by valor". Suvorov was mentioned by Alexander Pushkin and Mikhail Lermontov and in the numerous works of other Russian poets of the 18th and 19th centuries, such as Ivan Dmitriev, Apollon Maykov, Dmitry Khvostov, Kondraty Ryleyev, Vasili Popugaev. In 1795 poet and soldier Irinarkh Zavalishin [ru], who had fought under the command of Alexander Suvorov, wrote a heroic poem titled "Suvoriada", celebrating Suvorov's victories. Suvorov is one of the characters in the drama "Antonio Gamba, Companion of Suvorov in the Alpine Mountains" by Sergey Glinka which commemorates the Swiss expedition of 1799. In British literature, Byron caricatured Suvorov in the seventh canto of Don Juan. ^ Paret, Craig & Gilbert 1986, p. 356. ^ Chamber's repository, 1857, v. 6, p. 3. ^ History of the Life and Campaigns of Count A. Suworow Rymnikski by Fr. Anthing, 1799, P. 6. ^ "Наука и жизнь. №8, 2005". Nauka i Zhizn magazine. 2005. Retrieved May 28, 2018. ^ a b В. Могильников. Новая версия происхождения полководца А. В. Суворова//Генеалогический вестник. №13, 2003. ^ a b c Osipov 1944. ^ Cowley, Robert; Parker, Geoffrey, eds. (July 10, 2001). The Reader's Companion to Military History. Houghton Mifflin Books. p. 457. ISBN 978-0-618-12742-9. Retrieved 2006-09-10. ^ Faddey Bulgarin (ru:Булгарин, Фаддей Венедиктович) (21 August 2015). "Воспоминания (Memoires)" (in Russian). Российский Мемуарий. ^ Denis Dawidow (ru:Денис Васильевич Давыдов) (31 March 2009). "ВСТРЕЧА С ВЕЛИКИМ СУВОРОВЫМ (Spotkanie z wielki Suworowem)" (in Russian). Lib.ru/Классика. ^ Мосолов С. И. Записки отставного генерал-маиора Сергея Ивановича Мосолова // Русский архив, № 1. 1905: "Однако с дороги граф Суворов лучших из них, по просьбе Польского короля, отпустил 500 человек, в том числе генерал-майора Мейна, которого я взял во время штурма, в плен, и довольно штаб и обер-офицеров". ^ Mikaberidze, Alexander (2011). Alexey Yermolov's Memoirs. Lulu.com. p. 211. ISBN 1105258181. ^ Duffy, Christopher (1999). Eagles Over the Alps: Suvorov in Italy and Switzerland, 1799. Emperor's Press. p. 86. ISBN 1883476186. ^ Mirsky, D.S. (1999). A History of Russian Literature. Northwestern University Press. pp. 60–61. ISBN 978-0-8101-1679-5. ^ Keegan, John; Wheatcroft, Andrew (2014). Who's Who in Military History: From 1453 to the Present Day. Routledge. p. 79. ISBN 0415260396. ^ Giangrande, Cathy; Norwich, John Julius (2003). Saint Petersburg: Museums, Palaces, and Historic Collections. Bunker Hill Publishing, Inc. p. 71. ISBN 1593730004. ^ "Decree of the Presidium of the Supreme Soviet of the USSR of July 7, 1942" (in Russian). Legal Library of the USSR. 1942-07-29. Retrieved 2012-03-26. ^ Brezianu, Andrei; Spânu, Vlad (2010). The A to Z of Moldova. Scarecrow Press. p. 109. ISBN 9781461672036. ^ King, Charles (2009). Extreme Politics: Nationalism, Violence, and the End of Eastern Europe. Oxford University Press. p. 120. ISBN 9780199708246. ^ "Minsk Suvorov Military School". Retrieved 18 Dec 2014. ^ "Construction of Alexander Suvorov and Valerian Madatov military school on in Nagorno-Karabakh". Tert.am. 28 January 2014. Retrieved 14 May 2014. Macready, Edward Nevil (1851). A sketch of Suwarow and his last campaign : with observations on Mr. Alison's opinion of the Archduke Charles as a military critic, and a few objections to certain military statements in Mr. Alison's History of Europe. London: Smith, Elder. Peter Paret, Gordon A. Craig, Felix Gilbert. Makers of Modern Strategy from Machiavelli to the Nuclear Age. Princeton University Press, 1986. Râmnicu Sărat is a city in Buzău County, Romania, in the historical region of Muntenia. It was first attested in a document of 1439, and raised to the rank of municipiu in 1994. The Battle of Praga or the Second Battle of Warsaw of 1794 was a Russian assault of Praga, the easternmost suburb of Warsaw, during the Kościuszko Uprising in 1794. It was followed by a massacre of the civilian population of Praga. Count Pyotr Aleksandrovich Tolstoy was a Russian general and statesman. Count Pyotr Alexandrovich Rumyantsev-Zadunaisky was one of the foremost Russian generals of the 18th century. He governed Little Russia in the name of Empress Catherine the Great from the abolition of the Cossack Hetmanate in 1764 until Catherine's death 32 years later. Monuments to his victories include the Kagul Obelisk in Tsarskoye Selo (1772), Rumyantsev Obelisk on Basil Island (1798–1801), and a galaxy of Derzhavin's odes. Fabian Gottlieb Fürst von der Osten-Sacken was a Baltic-German Field Marshal who led the Russian army against the Duchy of Warsaw and later governed Paris during the city's brief occupation by the anti-French coalition. Suvorov Memorial Museum in Saint Petersburg, Russia is a military museum dedicated to the memory of Generalissimo Alexander Suvorov (1729-1800). It was founded in 1900 to commemorate the century of Suvorov's death and was inaugurated four years later, on the 175th anniversary of Suvorov's birth, with much pageantry, in the presence of Emperor Nicholas II. Alexander Mikhailovich Rimsky-Korsakov was a Russian general remembered as an unlucky assistant to Alexander Suvorov during his Swiss expedition of 1799–1800. The Italian and Swiss expeditions of 1799 and 1800 were undertaken by a combined Austro-Russian army under overall command of the Russian General Alexander Suvorov against French forces in Piedmont, Lombardy and Switzerland as part of the Italian campaigns of the French Revolutionary Wars in general and the War of the Second Coalition in particular. Semyon Georgievich Gangeblov was a Russian military commander of the Napoleonic Wars. He came of the Georgian noble family Gangeblidze, which emigrated to Russia in 1724. Friedrich Freiherr (Baron) von Hotze, was a Swiss-born general in the Austrian army during the French Revolutionary Wars, campaigned in the Rhineland during the War of the First Coalition and in Switzerland in the War of the Second Coalition, notably at Battle of Winterthur in late May 1799, and the First Battle of Zurich in early June 1799. He was killed at the Second Battle of Zurich. The Battle of Brest was a battle between Russian imperial forces and Polish rebels south-west of Brest, present-day Belarus, on 19 September 1794. It was part of the Kościuszko Uprising. Suvorov Museum is a historical and military museum in Timanivka, Tulchyn, Vinnitsya, Ukraine, dedicated to the memory of Russian Generalissimo Alexander Suvorov 1729 - 1800, who stayed and trained his troops in that area in 1796 - 1797. Wilhelm Christoforovich Derfelden was a Imperial Russian General of the Cavalry from a family of Baltic Germans. He fought in the Russo-Turkish War of 1768–1774, Russo-Turkish War of 1787–1792, Polish–Russian War of 1792, and Kościuszko Uprising of 1794. In the latter conflict he led troops in the battles of Chełm and Praga. After a period of unemployment, he joined Alexander Suvorov's army in 1799 as a military mentor to Grand Duke Konstantin Pavlovich of Russia. He subsequently led a corps at Novi, Gotthard Pass, and in Suvorov's Switzerland campaign.